Computer slow because of lack of RAM? Just make your USB Flash Disk or MMC as RAM … wow! Adding memory (RAM) is one of the best ways to improve performance. But memory is not cheap, and practiced hard for a novice user. In Windows Vista was known by the name of ReadyBoost, a concept of adding more memory without using RAM chips. You can use flash memory like USB flash disk and memory card (MC). You are not a Vista user? You are still using XP? Do not worry, you can still use the ReadyBoost feature in Windows XP. To improve the performance in XP by using the extra flash disk just like in Vista, you can use eBoostr. This application is able to work with the four devices at once up to 4 GB per device. I’ll explain a bit, the way its user .. If the process above is completed then in a flash disk or MC you have a file of size in great big size (in accordance with the charging amount of cache at the beginning), so you do not be surprised, and this file is hidden / hidden. 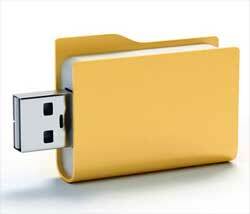 Flash disk or MC who used to eBosstr, can still be used to store other files as long as it has the elbow room. To add more RAM on your computer, you only live to plug the flash disk to a computer or MC who has been installed eBoostr.